The Motorola V190 brings new style and panache to everyday communications. With an ergonomic form, unbeatable talk and standby times, a vibrant color display, and MP3 ringtones the Motorola V190 delivers the best of the basics in a hassle-free, affordable and fun package. Billed as an entry-level phone, the Motorola v190 is actually a feature rich handset with quad-band global coverage capability. A speakerphone, instant messaging, MP3 ringtones, dual displays, USB connectivity and gaming support are all here-- a significant step up from entry level phones of the past. The phone features a sleek clamshell design with a large 128 x 160 color display with 65,000 colors. The outside cover of the handset sports a supplementary 96 x 32 monochrome display that can display time, call information, battery and signal strength, and more. A stub antenna is placed on the top right side of the unit. Up and down buttons for volume control are placed on the left side. Most of the phone's features and on-screen menus are controlled by a five-way center button on the handset's control pad. Meanwhile, there's a USB-capable data port for data connectivity (the USB connector also supports charging), as well as a standard jack to accept universal hands-free headsets. The V190 supports polyphonic ringtones as well as MP3 ringers, allowing you to use portions of your favorite songs to alert you to incoming calls. You can also assign pictures and ringers to your most common callers. A number of ringtones come preloaded on the phone, and ringer and Picture ID functions let you assign ringtones and pictures to your most common callers. For those time when you want to be silent and discreet, the V190 has a vibrate ringer mode. Plus, a built-in speakerphone makes it easy to talk without having the phone to your ear. Voice activated dialing makes calling your friends, family and associates as easy as saying their names. The V190 has all the bases covered when it comes to messaging and Internet connectivity. The phone features support Wireless Village instant messaging (carrier messaging charges may apply). There's also a built-in web browser for wireless downloads and mobile web browsing. Traditional text messaging, as well as picture and sound messaging are also supported by the phone. iTap text entry, which is a technology that makes it easier for people to enter words and text on handsets, is built into the unit-- a plus for mobile email and text messaging users. A number of handy software tools are bundled with the V190 including a calculator, a calendar, and an alarm clock. The phone also supports the SyncML synchronization protocol, so you can sync it with your PC-based calendars and contacts. The V190's USB connectivity can be used to transfer pictures, sounds and graphics to the phone's memory from your PC. Screensavers, themes and wallpapers can be set to your tastes. And the phone is Java enabled, meaning it supports games and application downloads written on the Java platform. 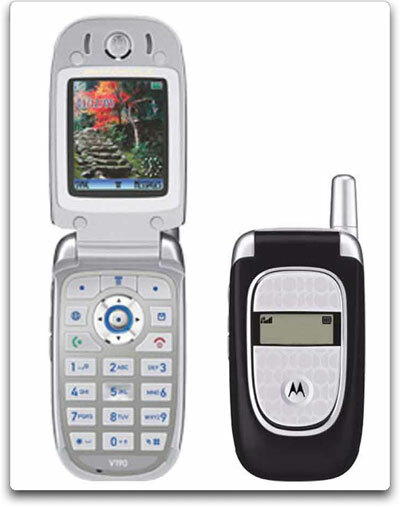 The Motorola V190 weighs 3.46 ounces and measures 3.37 x 1.81 x .91 inches. Its lithium-ion battery is rated at up to 10.8 hours of digital talk time, and up to 542 hours of digital standby time. It runs on the 850/900/1800/1900 MHz GSM/GPRS frequencies. The phone comes with a one year limited warranty. Not having to work in all the other gimmicks (camera, MP3) allows more focus to be placed on basic phone feature quality. User manual really doesn't cover the more subtle functional capability of this phone. Overall, the best buy in a basic flip cell phone. A steal at $40 - $50. Obviously not for the person who wants a camera, radio, MP3 player, photo album, etc., etc., etc. Reconditioned unlocked phone that works in Italy - good for a "vacation phone"
I ordered this phone in spite of reading another review that stated this phone is not unlocked and doesn't work in Italy. When I first opened the package, my heart sank as I thought that my faith in Amazon had been ill-placed. The phone had a "Cingular" logo on the front and was an obviously reconditioned unit with one small blemish on the side. When I turned it on, I saw the Cingular logo and thought "uh oh, locked phone!!" The story has a happy ending however... In Italy, I bought a Telecom Italia (Tim) SIM card, placed it in the phone, and began using it with no problems. As I type this review, I am sitting in Umbria with the phone at my side. Definitely a very economical way to call home and call within Italy...10 cents per min or so within Italy to other mobiles, and about 60 cents to call the USA. This is a very basic phone, and many of the menus have leftover Cingular features which don't apply (for example, their now-defunct MEDIA NET). However, the phone is a nice size, makes calls, receives calls, easy to adjust the ringer. Comes with a manual, charger etc. A plus is that this phone uses the same mini usb charger as my Blackberry Curve 8310 so I can just carry one charger abroad! I would recommend this phone for travel/vacation use. For constant use, you might want a phone with more features and less Cingular-legacy branding. They sent the wrong item!!!! This is an excellent basic phone. No complaints whatever. a phone to do. Very good sound quality. Screen very legible . Comes with a good selection of standard utilities that do everything that I want a phone to do, and a lot of things for which I have no use on a phone(sending faxes, internet browsing, etc). The phone has been extremely reliable, no problems whatever and has worked perfectly at all times. This is a phone that works on the GSM system. There is no problem with GSM service anywhere in Canada where I live. European SIM cards for it are readily available, which allow for very economical local use in Europe thus avoiding very expensive roaming charges. I have had no problems with GSM service when I am in the USA, but can only speak for the northeastern USA. have a camera. It is not an MP3 player. But it is extremely good at the basic function of any telephone : sending and receiving phone calls. Additionally, it has excellent sound quality and has been 100% reliable. the one i was sent was the silver not blue version but overall, i liked the phone and it was mainly due to the simplicity of the phone. outside display of the contact name and the word "calling" next to it.... it seems redundant to have that. can only have individual ringtones if on the phone itself and not on SIM card. simple functions difficult to find without the help of manual.